4AAAT: 4 x AAA battery charging/power tray w/ TAMIYA connector. 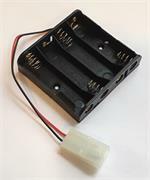 The 4AAAT is a battery charging tray that holds 4 x AAA "triple-A" battery cells. Has Tamiya connector. Can be used to charge NiCd or NiMH cells. Also can be used with Alkaline batteries for instant 6.0VDC power.